THIS IS THE FOURTH PAGE of documents for the FIRST HALF of 1931 on Nicaragua's Caribbean Coast region, housing materials dated in the eight days from April 22 to April 29. Participant & eyewitness accounts of the Sandinista offensive continue on this page, starting with the letter of Moravian missionary Mrs. Rufus Bishop, near Musawas, on the killing of Bro. Bregenzer and the fear & tumult it sparked among the Christianized Indians in the zone — themes continued in missionary David Haglund’s letter of the same date. In Cabo Gracias a Dios, Collector of Customs Lisandro Salazar offers a vivid description of the rebels’ brief April 15 seizure of the normally sleepy port town. 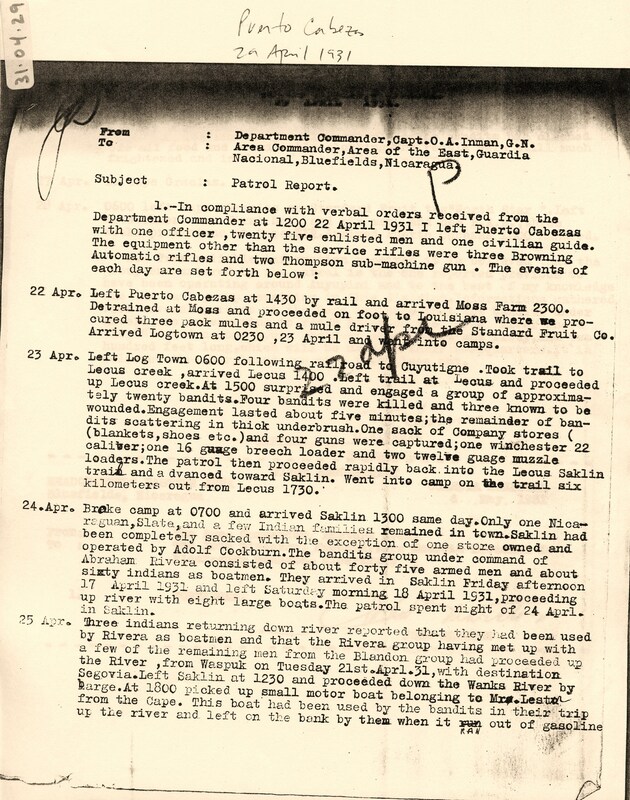 The patrol report of Lt. Darrah offers a vivid narrative of events in Logtown from the afternoon of April 11 till the morning of the 13th — a story told from a different angle in the letter of commendation for Capt. Wood. Capt. Inman’s patrol report describes his troops' efforts to chase down the retreating rebels, skirmishing with their rear guard (& killing four) while the main body of rebels, under Col. Abraham Rivera, hightails it back up the Coco River past Sacklin toward Bocay. Inman’s description of Saklin and Adolfo Cockburn’s untouched store there might fruitfully be read alongside Jefe Director Gen. Matthews’ letter of 27 April, which shows that Cockburn remains a major headache for the Marines & Guardia, who know he supports the rebels but can’t prove it, and are stymied by his status as Deputy in the National Assembly, which grants him immunity from arrest. We see the Guardia trying to improve their intelligence-gathering capacities in Capt. Schwerin’s lengthy summary of information obtained from two “secret agents” sent into the “bandit” zone. Back in Las Segovias, eleven days after Gen. Pedro Blandón’s death, Sandino seeks to regroup his troops and smooth over tensions between Sgt. Major Ladislao Palacios and Gen. Carlos Salgado, as we see in his never before published letter of April 24. The dramatic events of the first weeks of April 1931 will continue to echo loudly in the weeks & months ahead. Recommending Captain John C. Wood, U. S. Marine Corps, for the award of the Navy Cross. Col. John Marston, Bluefields, p. 1. 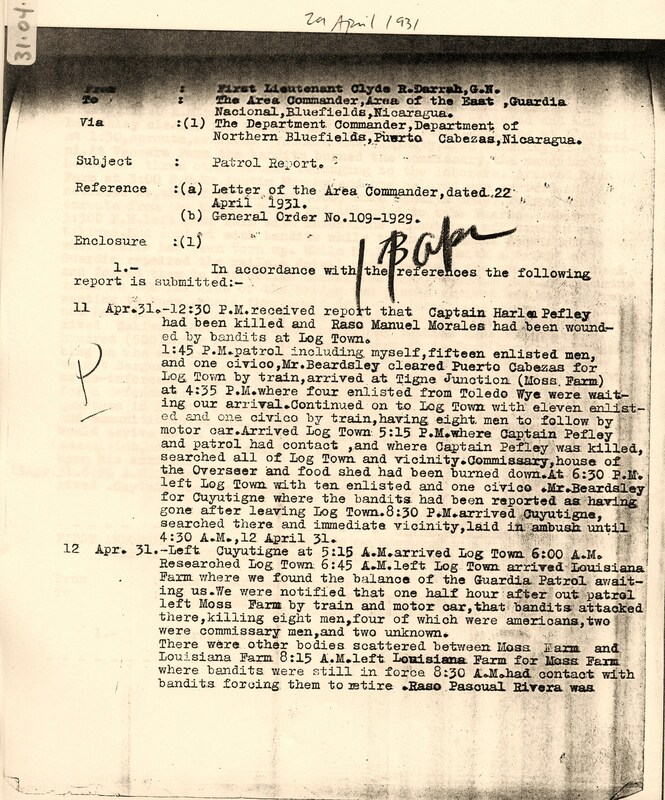 "23 April 1931 ¶ From: The Area Commander, Eastern Area. ¶ To: The Commanding Officer, Nicaraguan National Guard Detachment, U.S. Marine Corps, Managua. ¶ Subject: Recommending Captain John C. wood, U.S. Marine Corps, for the award of the Navy Cross. ¶ Reference (a): Captain Wood’s report of operations in PUERTO CABEZAS for the period 12-17 April 1931. ¶ 1. I hereby recommend the award of the Navy Cross to Captain JOHN C. WOOD, U.S. Marine Corps, for his exceptionally brave and courageous leadership described in the following suggested citation: ¶ FOR DISTINGUISHED SERVICE in the line of his profession as commander of a patrol of the Guardia Nacional de Nicaragua operating in the vicinity of Logtown, Nicaragua, on 13 April 1931. Captain Wood, then executive officer of the Eastern Area of the Guardia Nacional on duty in Bluefields, Nicaragua, having been directed by the Area Commander on 11 April 131 to proceed immediately to Puerto Cabezas, Nicaragua, to take over the command of the Department of Northern Bluefields as a relief for the late Captain Harlen Pefley, U.S. Marine Corps, killed in combat the same day, arrived in Puerto Cabezas at about 2.00 pm 12 April and, after endeavoring to reassure a panic-stricken town alarmed by rumors of bandit attacks, proceeded at 3.00 am, 13 April on a special train with four enlisted men of the Guardia Nacional out 120 kilometers of railroad known to be infested with active groups of armed outlaws to the relief of a Guardia patrol under First Sergeant Clyde R. Darrah, U.S. Marine Corps, which had been engaged in combat for the previous twenty-four hours. Taking personal command of the combined patrol. Captain Wood at 7.00 am, 13 April, proceeded by train to Snaki bridge where he was forced to abandon his train, marched his patrol nine miles along the railroad to Logtown where, ably assisted by two Marine Corps planes equipped with bombs and machine guns, he vigorously attacked a large group of bandits under the command of the jefe, Pedro Blandon, which attack, characterized by the prompt, efficient and vigorous use of the force and weapons at his disposal, resulted in the deaths of Blandon and at least twenty of his men and completely dispersed the other outlaws from the scene of the action. In this operation Captain Wood, within twenty-four hours [...]"
Recommending Captain John C. Wood, U. S. Marine Corps, for the award of the Navy Cross. Col. John Marston, Bluefields, p. 2. "[...] 2. ¶ Subject: Recommending Captain JOHN C. WOOD, U. S. Marine Corps, for the award of the Navy Cross. ¶ …of his departure from Bluefields two hundred miles away, destroyed the band of bandits that had ambushed and killed Captain Pefley two days before, killed its notoriously vicious and cruel leader, saved the lives of many persons who were endangered by the presence of the bandit group, relieved the threat against the town of Puerto Cabezas which was the declared goal of the outlaws and inflicted a loss upon organized banditry in Nicaragua which had a most discouraging effect upon the general offensive then being launched against the East Coast of Nicaragua. This remarkable engagement was successfully conducted with the loss of but one enlisted Guardia wounded. During the entire battle Captain Wood distinguished himself by the display of extraordinary bravery, coolness and leadership and by exceptional judgment, initiative and military ability. ¶ JOHN MARSTON"
Letter received from Mrs. Rufus Bishop (near Musawas) dated April 23rd, 1931. To S. H. Gapp, Moravian Church, Bethehem PA, p. 1. "It is now well established that Bro. Bregenzer has been killed by the bandits in or near Musawas. That his family is in hiding somewhere there and has as yet not come out. That Cape Gracias has been taken by the bandits and everybody is fleeing from there. That up the coast, it is not altogether safe to be and one should seek for his own safety. Well here, is our story. ¶ Rufus Bobbie, and I were over in Dakura for Holy Communion over Sunday April 12th. On Monday morning as we were getting ready to come over here to Sandy Bay, Rufus heard from a man returned from Bilwi that the bandits had come out in the lines, and had robbed and burned some commissaries and had killed some men. So many stories were about that we did not know just what to believe, especially as the Indians have a way of mixing things so that really one story appears to be four or five. We also heard that they were out on the Wanks again, and some indefinite things about their being at the Port Cape. On Tuesday afternoon, of last week we saw two planes going in that direction, so then we knew there must be something up there and that the planes were going to investigate so we thought, and were sitting pretty, and I was making the sewing machine hub and Rufus was doing some packing of odds and ends and I was persuading him to wait till the next week to bother me too much about it, and by that time I hopes (sic) to have Bobbie’s suit pretty well under way and could help. I remember Wednesday morning, I was just fixing a suit for Bobbie, and went past a window when I heard a familiar voice sing out “Ooooooo” and I shouted to Rufus that something must be wrong with the Stortzes because it both looked and sounded like him. I was scared near to death for he was carrying the baby and Edna and Carol were nowhere in sight. But he told me at once they were a little way behind him. The bandits had come to the Port on the day before, and robbed and he was not sure just what all, but some of his people told him one of the first things the leader had said, “Where is that Parson, I want to see his blood” and that Bregenzer had already been killed and how it was done. Before the bandits arrived at the Port he had a note for the Haglunds who had left their children with them since the other scare in January. I see I am getting a little mixed. Mrs. Haglund took the children on Thursday to the Port to spend Friday there, and Saturday morning started up the river, thinking all was safe and now for the children as things had been quiet for sometime, they met Mr. Haglund somewhere on the river and were spending Sunday in Andres and going to Wasla perhaps Monday morning, if not Sunday evening, when the people came telling them the bandits were already in Wasla robbing the mission house and asking for him, so he turned back in the gas boat to the Cape, sent a message to the Stortzes that they were going to go to Kruta and Honduras and would stop at a certain place, where Stortz always rests going to Kruta, and wait a day for them. They should come and not stop as it was really serious this time. We heard afterward that they just managed to get to the saw mill where the men helped to run the boat into a little creek out of sight and hide in the bush around there when the bandits were upon them, after they passed the Haglunds went a little further up to Klupki and across on foot poor things, and how we believe they are with Miss Kreitlow at the Heaths, but we hope to be sure about them all in a few more days for the Escupa Fuego which brought us down returned up the coast that same night with orders to go and bring them all down. We have heard indefinitely that they are in Honduras, but how safe we do not know and Miss Kreitlow is also only supposition as far as I heard, the Port Cape, and while the Indians had said they would build a little hut in the bush and keep them safe, they were afraid the bombing would scatter the bandits, all through the bush and they might meet them there, also they could not have much in the way of supplies and they little Carol and a two months old baby who in on the bottle, and there would be plenty of mosquitoes. So quite suddenly he decided to come to Sandy Bay not knowing whether it were for the best, but he could not go to Honduras with the Haglunds . . . "
Letter received from Mrs. Rufus Bishop (near Musawas) dated April 23rd, 1931. To S. H. Gapp, Moravian Church, Bethehem PA, p. 2. ". . . because the bandits were blocking the way. He got a sea going dory and came all night in an open boat with his family to us. I think the Lord sent him for we would have known nothing and the rumours would have set us wild. We tried to persuade them we were all safe in Sandy Bay and together remained until Friday by that time we had packed our clothing and a lot of our bedding and some supplies and sent them down to John Rivers to take it that night to Bilwi. When our people heard we were leaving they all came and begged us not go to, at least to stay over Sunday, and Rufus and I did not like running away at all, though the Stortzes had brought us the news about Bregenzer being killed, if anything came up they would be all on the lookout and would let us know and would hide us or ship us off in a big boat to Bilwi at once, but at least to stay over Sunday. Our things were already in the boat but Rufus sent word to John Rivers, we would not be leaving that night, but still we were uneasy for he has the best boat to go by sea, and for us with our children, the only one we really wanted to go in at all, and his family was very much frightened and might ran away to the keys any time and if they left us we might have a hard time. Anyway we were staying that night, we had just put out the light, the Indians had told us they would be walking around all night, they would not sleep at all some of them but would keep watch. The Storzes were still feeding the baby but we were just in that glorious state where everything is forgotten and the bed feels so good for we were very tired. Suddenly we heard a yell which sounded like a woman scared within an inch of her life, yell “Parson, Ispail Liani aula” (the Spaniards are coming) and we who were half asleep thought they must be so close to the house they could not run to tell us so as to give us some warning had yelled. We grabbed our babies and ran for a little clump of bush near the school house, which is part of the congregation watercloset, it was the only thing we could think of for the moment and we did not know from what direction they were coming, we thought we could get out of sight there, at least they would go the mission house before they began searching around outside and as soon as we could find out from which direction they were coming we would try to go further under cover of the bush. Soon we heard some of the boys coming along with an accordion and jaw bones right past the place where we were when they were just past us they stopped and began talking quietly and I heard something about the Parson. We knew they were only Miskito boys so the men went out and asked them about the yell, where it had come from, and where the bandits were supposed to be, but they knew nothing about it, had not even heard the yell, then we were sure they had done it themselves, but we were so wrought up by that time that we could hardly go to sleep, I put on an old dark dress, and slept the rest of the night in that, Edna had none so I gave her a dark brown slip I have, and the men slept in Kakki shirts and dark pants. The next day we realized we were under such a nervous strain that we were no good there, and at the same time, a man came to the house and said that a few days before two or three strangers had been to him in the night asking about what kind of place Sandy Bay is and what kind of a parson was there, thing nationality, etc., and gave the impression that he knew things he did not want to tell, and did not want to be quoted about anything he said, but he thought we would better go sooner than we had planned, but he said not let it be known when you preach your farewell sermon, just do it one day and leave either that night or the next day, right away afterward. So we were planning to leave for Bilwi that night, the men were saying they would take us to Bilwi where we would be safe or send us here trying to collect and look aftger the things, going together through the two districts. On Saturday afternoon we were just finished getting our last things ready some food for the journey, when someone came tearing in at the gate so frightened and out of breath they could hardly talk, saying the people in Lidakura sent word they should get the parson out of the mission house and away as a gasboat was coming into the lagoon, and they did not know who or what it was, but as they had not landed we had a little chance to get away from the mission house at least until they found who it was. Again we grabbed our children and a few wraps this time, and some of the food . . . "
Letter received from Mrs. Rufus Bishop (near Musawas) dated April 23rd, 1931. To S. H. Gapp, Moravian Church, Bethehem PA, p. 3. " . . . . . . we had ready and ran out of the house, leaving it wide open, we ran as hard as we could go, the people helping with the children and things, to Usupum which is in opposite direction from Lidakura, there they put us into one large pitpan and our things in another, and started up to Winkalaya, we were to go the last house at a certain place, and wait there while they put a boy on a horse and sent him to Lidakura to find out the particulars and would send at once to us orders were given whoever gets into this boat does not leave the parson but goes with him and stays as far as he goes and needs you, or returns with him as the case may be. We had not come to our destination until we saw a boy on a horse signaling us when we drew over to the bank we were told that the gasboat contained Johnnie Gosden and his family he was bringing them from the Cape to her mother who lives in Sandy Bay and he wanted to talk to us. As soon as we heard the name we knew it was all right, and Johnnie probably had something to tell us that it would be to our advantage to hear, he also brought news from the Cape, which the Stortezes wanted. Nobody had been killed at the Cape, and the planes had made the bandits leave earlier that they intended, and we had better proceed to Bilwi for the present for the bandits said they would return in nine days time and take the Cape. The first thing they did they smashed the wireless station, and then began robbing, the leader gave it out to his friends that the next trip he would probably not be among them and they would have to look out for themselves. Nobody was killed either bandits or Port people by the bombs. We left Sandy Bay Saturday night just after midnight, on our way to Bilwi, leaving the house with the things all over it, one or two boxes packed and closed at least two of jam and cashew nuts, etc., packed and not closed, and other things, curios, tiger skins, and such like all around the place, and we do not know whether we will ever see half of them again. The only dishes I feel sure about at all is the nice tea set which Iva sent me the first Christmas we were back, which we have with us with one or two extra things which we could squeeze into the box, all the rest, the china, the lovely ice tea set you all sent still there and unpacked. I waved goodbye to them for if the bandits do not molest our house, the Indians can get in and already when we came back that Saturday evening some things were missing, and now we feel sure we have gone for good more things will go, among them about 20 good fat hens, which we would so enjoy having down here, for next week is Stortzes birthday and our wedding anniversary passed with a bare mention of the fact. We landed about noon that day in Bilwi. There was a big steamer in when we arrived in our little boat, dirty and disheveled as always from up the coast and because we were so excited we had packed all our good things and came away in our worst things which we intended to take off before leaving Sandy Bay and leave them there, I know I had an old torn dress, dirty white keds with a hole in them, black stockings, which had acquired quite a hole in the leg sometime or other and a big native palm leaf hat which I had worn to protect my eyes from the sun’s glare on the water, it was the one I usually wore when I was working in the garden. Stortzes declare they have a few things they would like to add to them and we turn them over to the museum in the Ephrata House The Contessa Ceida had a number of tourists on board, evidently, or else they were some of the Americans who were leaving for the States, anyway they looked just the opposite from what we did. I did not notice them so much for they did not bother me, anyway my hearing is not so sharp and I had to keep sharp eyes on Bobbie on the wharf, but Mrs. Stortz said they just looked us up and down one after the other “Now who do you suppose these people are and what do they want here. Do you suppose it is safe to let them land,” one woman said, the man who was with her sized us up and said “Oh, I guess it is all right for them to be here. “ I wonder what they would have said had they known what we really were and where we came from, and some of the stories we could have told them. Mr. Woor (it is German and I do not know how to spell it, I know that is not right, but it is the way it sound) (sic) came in the evening with a wireless from Conrad saying he was to get us and the Dannebeers [Dannebergers] out from Sandy Bay and Yulu, he said he had sent us both messages the day before but of course they arrived in Sandy Bay about the time we arrived in Bilwi. On Monday he again received a wire from Conrad to send us and the . . . "
Letter received from Mrs. Rufus Bishop (near Musawas) dated April 23rd, 1931. To S. H. Gapp, Moravian Church, Bethehem PA, p. 4. " . . . Stortzes to Bluefields, as well as the Dannebergers. Rufus and Howard had sent a wireless upon arriving that we were in Bilwi to save him some anxiety. But several messages had been sent to Yulu to the Dannebergers and nothing could be heard from them, the people who came down always said there was no one in the mission house in Yulu. Now we knew the Dannebergers had planned a week in the Tuberus for the whole family, but whether they had gotten up there safely or what had happened to them we could not find out, the bandits were all around up that way, and it seems that the day the Dannebergers left the railroad taking to dory for the trip up the Bandits got to the railroad about the same place and whether the Dannebergers had gotten there first and were safely beyond them before they came out for the other side we had no way of knowing, except that we heard nothing of the Dannebergers, and we thought if they had been caught it would have leaked out somewhere as the other did at Musawas. But it was time now for them to be returning and how would they make the trip down, perhaps going blindly into a trap, it would be bad enough anyhow, but with Margaret it would undoubtedly be terrible. We could do nothing but pray, inquire and worry and walk up and down and when a message could be sent send it, Monday evening, Mr. Woor, came again with a wire that he was to send us to Bluefields, I believe I wrote that yesterday, Tuesday, the Escupa Fuego came in leaving that afternoon for Bluefields and so we came on, shortly after we arrived here on Wednesday, Mr. Shimer had a wire from the Dannebergers that they feel safe for the present at least in Yulu. The Escupa returned up the coast for the Haglunds, Miss Kreitlow and the Heaths, and we are expecting her to return early in the coming week. And scouts have been sent out for Mrs. Bregenzer and her family, and today a woman is here to clean rooms in the school house and make them ready for her and for the others up the coast when they arrive. We will wait here a little longer for our things, as Rufus asked John Rivers to pack them up and send them down to us rather bring them himself to Bilwi and see that they come on down to us here. Rufus keeps talking about slipping back up the coast and having communion once more among our people as we had planned but I am a little nervous about it, things will quiet down as they did before and all of a sudden he will be caught unawares, Stortz also talks of such things, and I do not know but that they may do it still. I do not expect to see half of our things, or if I do it will be only the pieces of a lot of them. If our things should come down soon I do not think we will stay her very long, otherwise it may be the end of May before we are starting homeward, and Rufus may even try to make the trip up the Coast. The Spanish people and everybody is upset about the missionaries being molested, and I understand the padre himself said this would be a curse to Nicaragua, that they are ill treating God’s servants in such a way. When the padre speaks out that way in church about it it makes one have a very warm feeling for him, notwithstanding the different point of view we have on other things. Rufus will return from Pearl Lagoon sometime this afternoon and as I am making sugarcake for the Family today and the boat is expected in before so long I must stop and get the mail closed up and attend to the other things I have to. Should we leave shortly for home, you may not have another letter from us, but in that case we will wire you either when we leave here or when we arrive in New Orleans." Letter from David Haglund, en route from Wasla to Kaurkirra, to Bro. S. H. Gapp, Moravian Church, Bethlehem PA, p. 1. "Bilwi, Nicaragua, August 23rd, 1931. Dear Bro. Gapp:-- ¶ Many thanks for your letter of recent date. As now the days’ service, are ever and I am alone I thought I would write3 you, for planning as I do , to to make a long journey, it will take me weeks before I could get off a letter to you. ¶ I arrived here in Bilwi Wednesday last week with the intention of trying to work the Wanks districts from here. I took a trip with the fruit train into the company’s plantations last Friday just to have a look on the undertaking, but the Lord was (with) me and I was able to make valuable arrangements for my journey. ¶ Near to the end of the line I met with one of our Indian helpers from Bilwas Karma Congregation. He told me that our Evangelist at said station was expected any time with him family, they evidently being afraid to stay alone so long, we not having returned to them as yet. I at once hired a young Indian Christian to walk over to Bilwas Karma Saturday with a message from me that I was coming and the Ev. Family should stay till I arrived. I told them on which and where to meet me with a horse, etc. I am glad I could make that arrangement, for now my arrival has been announced there and the Christians will all meet me in the new large Church on the coming Sunday and we will then celebrate the lord’s Supper and I will proceed to Wasla. From Wasla to Anres, then to Old Cape, then to Sandy Bay, then to Dakura and from there back to Bilwi which will be sometime in the first part of Oct. D.V. ¶ The time for a visit of this sort is the best possible just now, for these reasons: The Sandinistas have just been down in our district, they got a beating from the Guardia National near Sacklin and were forced to retire up the river again. It is therefore a chance for me NOW to go there before they return again, which might be in a couple of weeks. Secondly the time is just now when the Congregations will be looking for the Holy Communion. It will strengthen their faith and confidence quite a bit, I hope, if I can make the trip successfully now. I left my family in Bluefields chiefly for the sake . . . "
Letter from David Haglund, en route from Wasla to Kaurkirra, to Bro. S. H. Gapp, Moravian Church, Bethlehem PA, p. 2. Map of northeast Nicaragua, with place-names. Summary of Information Obtained from Secret Agents. Capt. J. P. Schwerin, Puerto Cabezas, p. 1. "DEPARTMENT OF NORTHERN BLUEFIELDS ¶ GUARDIA NACIONAL DE NICARAGUA ¶ PUERTO CABEZAS NICARAGUA ¶ 24 April 1931 ¶ SUMMARY OF INFORMATION OBTAINED FROM SECRET AGENTS ¶ At about 0600 April 11, 1931, a group of about 60 bandits appeared in Cuyutigne. They had spent the night at Lecus River, four hours from Cuyutigne. These bandits were not well armed nor did they have much ammunition. Among their arms were two rusty Thompson sub-machine guns. Immediately upon their arrival in Cuyutigne the bandits asked the number of Guardia in Puerto Cabezas and if there were any Americans in the vicinity. They were told that there were very few Guardia in Puerto Cabezas and that there was a timber cruising squad about four miles due south of Cuyutigne. A group of about twenty bandits was dispatched to the timber cruisers camp, where they killed John D. Phelps and John L. Pennington, both Americans, and captured as prisoner R.P. Davis who was killed sometime later. At about 0900 a patrol of 40 men was sent ahead to Logtown and about twenty men sent back to Lecus river to summon the balance of the bandits, about 100, who had been left at Lecus River. In Captain Pefley’s contact in Logtown on April 11 about 40 bandits took part and remained in possession of the town after the Guardia withdrew with Captain Pefley’s body. Upon the arrival of the main body in Cuyutigne, General Pedro Blandon sent Captain Timoteo Altamirano with 30 men over the trail to Auyupini. Altamirano was followed in about an hour by Coronel Padilla. The plans were for Altamirano and Padilla to join forces with Blandon at the “Y”, 34 kilometers from Puerto Cabezas on the railroad line. Blandon expected to meet no resistance on the railroad and had expected to come by train to Puerto Cabezas. Had the bandits been met with no resistance, their plan was to march on Puerto Cabezas from Kilometer 23, entering by way of Tuapi and Kamla. ¶ In Captain Pefley’s contact two bandits were wounded and died later at Lecus River. The buildings at Logtown were burned during the afternoon of April 11. Lieutenant Darrah’s patrol, which spent the night of 11 April at Cuyutigne was cut off from Puerto Cabezas by the main body of the bandits under Blandon, about 100 men. Blandon troops were so disposed that all trails to Puerto Cabezas were barred. Word was passed among the bandits that a drive would be made on Darrah on the morning of April 12. ¶ On 12 April the commissaries at Moss, Vaccaro and Louisiana Farms were looted and burned. Some of the bandits had been stationed along Darrah’s expected route out of Logtown, but they deserted their posts in view of the rich loot to be obtained by robbing the commissaries. At 0900, at Moss Farm, April 12, in Lieutenant Darrah’s [...] "
Summary of Information Obtained from Secret Agents. Capt. J. P. Schwerin, Puerto Cabezas, p. 2. "[...] SUMMARY OF INFORMATION OBTAINED FROM SECRET AGENTS ¶ First contact , two bandits were killed and two wounded. Airplanes, Lieutenant Young and Jack, flew overhead just after this contact and bombed the bandits positions. In Lieutenant Darrah’s second contact of the day, at 0200 at Louisiana Farm, there were no bandits casualties. Blandon was in command of the enemy in both contacts. ¶ Timoteo Altamirano and his detail of 30 men did not continue to Auyupini, as he had been directed, but turned back into the Tigne District and looted. Padilla continued through Auyupini to Sissin, where they robbed the Indians and impressed them into service. ¶ On the morning of April 13, the disposition of the bandit forces was as follows: Padilla and 20 men at Auyupini; Timoteo Altamirano and 30 men in the Tigne District, approaching Wawa Central; and Blandon with the balance of about 100 men in the vicinity of Logtown. In Captain Wood’s contact there were about 60 bandits, the other 40 men of Blandon’s group being in Moss and Vaccaro Farms. Blandon knew of Captain Wood’s approach, and had disposed his troops so as to best defend the town. However, Blandon did not expect that Wood was so close, and the various posts placed around the town were at their leisure and gambling, when the first shot was fired. The bandits were waiting for Captain Wood, but did not realize he was so close. When the first shot was fired, the bandits on the surrounding hills commenced firing and those in Logtown dived under buildings and commenced firing. No less than eighteen bandits were killed in this contact and enough others wounded so that the total loss of life of the bandits in the contacts of April 11, 12, and 13, was not less than thirty, including Blandon. Other jefes in Wood’s contact were Coronel Juan Altamirano,a Captain Saturnino-----(Surname unknown) and one man dressed in black clothing and carrying an umbrella, but no gun. This man was thought by the Indians to be a priest as the bandits respected him and consulted him in every move. After the contact in Logtown the bandits split into small groups and reformed at Lecus River. There were about 75 men in this group, which was now without a leader and disorganized. ¶ On the afternoon of April 13, Coronel Padilla arrived from Sissin at Kamla, nine (9) kilometers from Puerto Cabezas over the railroad, about three miles from the aviation fields. Padilla left his main body in the bush at Kamla, and he himself with four men came as far as kilometer seven (7) on the railroad line. With field glasses Padilla examined Puerto Cabezas, decided that Blandon had not…..arrived in part, and returned, after dark to kilometer nineteen (19) with his entire group to await Blandon’s arrival by train. Padilla laid an ambush along the railroad track at Kilometer 19, and at 0300 April 14, they were notified of Blandon’s death. Padilla then set to the railroad bridge at Kilometer 21. Padilla returned with his patrol to Sissin and sent four men over the trail to Siksikwas to find out if the main body were coming along the railroad. 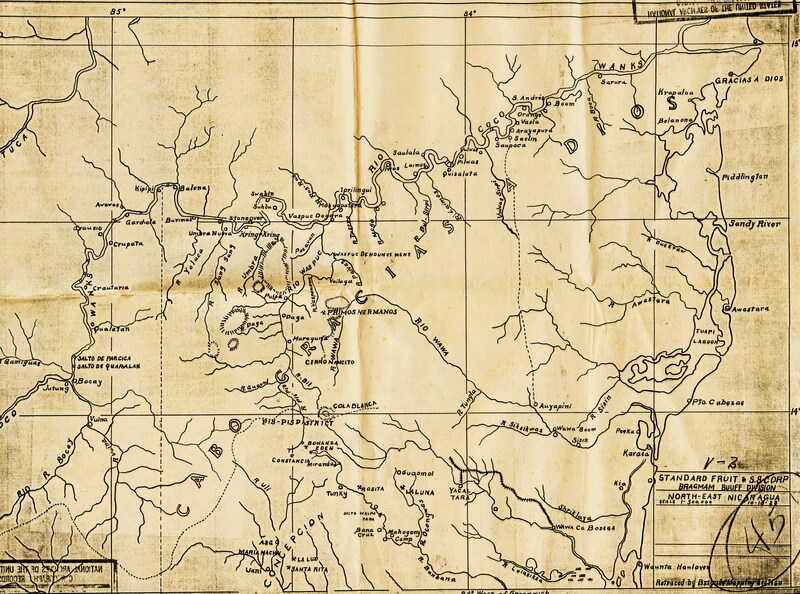 On April 14, eighteen bandits with fourteen loaded mules cleared Cuyutigni in the direction of the Coco River. Captain Saturnino [...] "
Summary of Information Obtained from Secret Agents. Capt. J. P. Schwerin, Puerto Cabezas, p. 3. "[...] SUMMARY OF INFORMATION OBTAINED FROM SECRET AGENTS ¶ [...] took command of the main body of bandits and ordered all groups to Laimus, on the Coco River, for reorganization. The last group, Padilla’s Sissin patrol, left Lecus River on 17 April. ¶ Before departure of the Bandits, all the Indians in the vicinity of Auyupini were summoned and told to get all the supplies they could, as the bandits would return sometime, whether it be three weeks or three months. ¶ The bandits had seven boats built at Bocay by the Indians, who supply labor of all kinds. These boats can carry thirty men each in addition to the crew. With their present supply of boats ,the bandits will not be handicapped by high water in the rainy season Their transportation problems are solved by these boats. 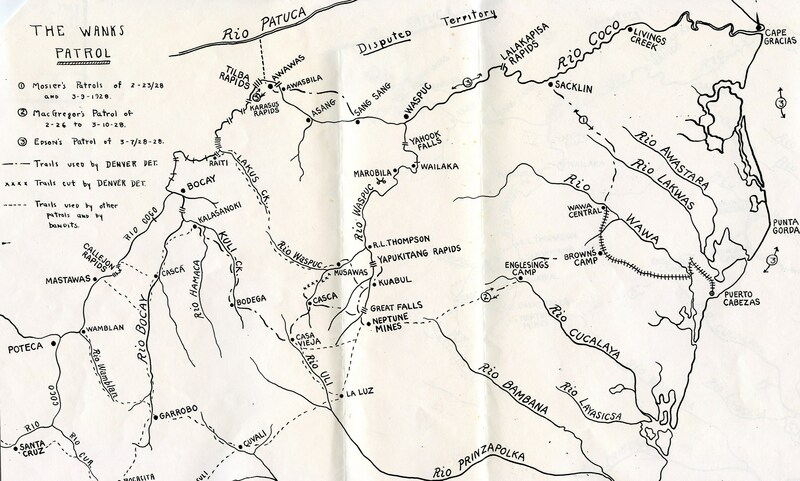 ¶ On Aril 18, Adolfo Cockburn, of Saclin, Diputado Suplente from Cabo Gracias, received a letter from A.C. Sandino ordering Cockburn to get word to Abraham Rivera, jefe of the group operating on the Coco River below Saclin, to proceed to Cabo Gracias and capture the town without delay. Cockburn is the Jefe quartermaster on the river and has organized the Indians in labor groups to work for the Bandits. Cockburn advised the surviving bandits leaders to return to the Kisalaya-Laimus area for reorganization and to await orders from higher authority. ¶ The plans of the bandits are believed to be that they will remain on the Coco Rive in the Laimus-Kisalaya area, awaiting orders, ammunition and reinforcements from a superior commander, possibly Sandino. Word has been dispatched to Sandino’s headquarters reporting Blandon’s death and requesting his orders. It is now believed the bandits intend to return above Waspam. J P SCHWERIN"
"Cuartel General del EDSNN, 24 de Abril de 1931. ¶ Señores ¶ General de Divición, Carlos Salgado P. ¶ Coronel Efectivo Ines Hernandez Gomez. ¶ Teniente Coronel Reyes Lopez. ¶ Sargento Mayor Teodoro Polanco y ¶ Sargento Mayor Ladislao Palacios. ¶ Campo de operaciones militares. ¶ Con esta fecha ha dispuesto esta Jefatura Suprema de nuestro Ejercito que permanezca un Jefe expedicionario de nuestro Ejercito, en un area que comprenda desde Plan Grande, Loma Chata, El Ojoche, El Arco, Cuje, El Limon de Telpaneca, Condega, y Darailí. ¶ En esa virtud, se ha dispuesto ordenar el hermano General de Division Carlos Salgado, para que sea el quien con su columna expedicionaria, controle militarmente la mencionada zona. ¶ En esa consideracion, se ha dispuesto refundir las actividades de las Comandancias del Ojoche y El Arco, en las fuerzas expedicionarias al mando del General Salgado. ¶ Tambien se ha dispuesto nombrar de segundo jefe de la columna del General Salgado, al hermano Coronel efectivo Ines Hernandez Gomez, y de tercer jefe de la misma fuerza expedicionaria, al hermano Teniente Coronel Reyes Lopez. ¶ El General Salgado, lleva instrucciones para establecer su Campamento de operaciones en cualquiera de los lugares de la zona mencionada. ¶ Asi mismo lleva instrucciones el General Salgado de nombrar Jefe de comision militar, quienes recorran la mencionada zona con patrullas de nuestras fuerzas. ¶ Los jefes quienes deberan de recorrer la indicada zona deberan de ser entre otros, los hermanos Polanco, Palacio, Rios, y otros a quienes nombrará el mismo General Salgado. ¶ Si el Sargento Mayor Ladislao Palacio se niega a disciplinarse ante las ordenes del General Salgado, en ese caso, el Mayor Palacio deberá de reconcentrarse a este Cuartel General en donde permanecerá hasta que esta Jefatura Suprema de nuestro Ejercito, tenga la oportunidad de salir en guerra campa sobra el interior de nuestra Republica. ¶ Supongo de que todos los jefes quienes se les dirije esta nota, tendran conocimiento de que los vecinos de esa zona, quienes se han presentado al enemigo, han manifestado por escrito a esta Jefatura Suprema, de que lo han hecho por que con mucha tardansa se cruzen nuestra columnas expedicionarios en los lugares por donde ellos viven. ..."
"... Tambien tendran conocimiento de que existen muchas rivalidades entre los jefes menores de esa zona, y creemos que habiendo un jefe expedicionario, podran las cosas caminar mas satisfactoriamente. ¶ No se me oculta de que entre Mayor Palacio, Mayor Polanco, y otros jefes, hayan antipatias con las que perjudican, aunque ellos no lo crean, a nuestra causa. ¶ Nuestro hermano General Salgado, es un hombre serio y le considero capasitado para poner todas las cosas de esa zona en su lugar. ¶ Tambien el General Salgado, podrá sacar comisiones, por Mozonte, La Concordia, y cualquiera otro lugar que él lo estime conveniente pues se le ordena pararse en esa zona, para ejercer una vigilanza mas de serca en los asuntos de los vecinos de esa zona. ¶ Toda la gente armada que tiene el Coronel Reyes Lopez, deberá de ponerla a las ordenes del hermano General Carlos Salgado. ¶ El hermano Ladislao Palacios, Comandante de Yali y Condega, tambien se pondrá con las armas a sus ordenes, bajo la direccion inmediata del General Carlos Salgado. ¶ El General Carlos Salgado podrá hacer de que se mantenga en El Arco de Comandante de los Pueblos de Yali y Condega el hermano Ladislao Palacio. Pero esto será siempre que convenga la permanencia del Mayor Palacio con ese cargo. Nosotros no queremos que existan en ningun lugar Jefes que aflijan en alguna forma a los vecinos. ¶ Por aparte de esta nota, van los nombramientos de segundo jefe y de tercer jefe de la columna expedicionaria al mando del General Salgado. ¶ Cuanto el primer jefe, por algun motivo no pueda desarrollar alguna actividad lo deberan de hacer el segundo y tercer jefe, y cuando no puede ni el primero ni el segundo, lo hará el tercero. ¶ Espero pues de que a los jefes a quien les llegue esta nota, se sirvan acusar recibo inmediatamente a esta Jefatura Suprema de nuestro Ejercito. ¶ Sinceramente vuestro hermano, ¶ Patria y Libertad /s/ A. C. Sandino"
Letter from David Haglund, Kaurkirra, Nicaragua, to Dr. S. H. Gapp, Moravian Church, Bethlehem PA, p. 1. "Dear Bro. Gapp. -- ¶ The letter I wrote on the way from Wasla to here I hope you have received. I will try to give you a few more details of our troubles today, but the real extent of it I do not know myself till I get direct communications with Wasla again, and that is a little difficult and for me dangerous. ¶ The plan of the Sandinistas was evidently—I have also hear it said—to be over us at Good Friday or Easter. But their doings in Musawas plus very little water in the Waspuc at this time of the year evidently delayed them, all that was God’s mercy. Travel after Easter Lent my wife with 2 men went down to Old Cape to take up our children, they having been there with Bro & Sr. Storz from the middle of Febr., the first time we run for them. I went along with the “Nazareth” to Andres where I intended to give H.C. (Holy Communion) and perform a few marriages, etc. till my family would return. That week on Thursd (9th) they arrived at Ulwas and that very suddenly. Friday 10th before the news had reached Wasla they arrived on horseback, surrounded the house before they broke in. Not finding us home they searched for valuables such are few among missionaries. They took my wife’s dresses, my suits, typewriter and other smaller articles along . . . "
Letter from David Haglund, Kaurkirra, Nicaragua, to Dr. S. H. Gapp, Moravian Church, Bethlehem PA, p. 2. ". . . ¶ They, so we are told, tore up a lot of papers and books and smashed up furnitures, etc. before they left. I do not know whether or not they returned to look a second time. If they did our loss is great, but if they did not, quite a few things are saved by Indians. In what condition and how much or how little we get back is still to be seen, yet hope a good thing. I was in Andres when the news reached me. The Evangelist in A. Br. Leo Muller with family went with me to Boom. There we met our boat coming from Cape. The people made a camp for us in the bush. We slept 2 nights there but did not feel safe so we took the Nazareth and went downstream on (?). Our plan was to try to walk the beach over to Honduras to Kaurkira. I had 2 scenes in view in coming here. First of all this is a station with enough work for 3 workers, secondly, from here we will hear how things develop in the Wangks river. We felt it our duty, however, to notify Bro. Stortz of the danger. We went therefore down to Cape, sent him a letter of warning, returned the following day upstream to Kluki and crossed from there over to Honduras. We had a very narrow escape, for that very night they passed by and took Cape, we sleeping in the village about 800 yards from the river, not knowing anything of their passing till in the morning. . . . "
Letter from David Haglund, Kaurkirra, Nicaragua, to Dr. S. H. Gapp, Moravian Church, Bethlehem PA, p. 3. ". . . I don’t want to write details of our journey to Kruta and from there to Kaurkira. It was a very hard journey with children and sacks in the burning sun along the beach. But the Lord supplied the needed strength, according to His promises. At Kruta we took Miss Kreitlow along, passed the Kruta river—(? )—and slept on the beach under God’s hand in the open air, thankful for having reached Honduras. From there to Kaurkira we took it slowly. We are here just one week today, Mond., The Heaths do all they can for us, as soon as the new house is up accommodations will be better. While I write this I hear that the Sandinistas went down to Cape for a second “call”. How this will end is impossible to foretell. But is clear that we cannot work in the Wangks river as long as conditions remain as they are now. We are awaiting further orders as to where we shall go or whether we shall stay here. We are short of many things, having left Wasla just for 4-5 days when we had to run. But we are alive, and we learn to come through day by day. It is hardest for my wife, she lost practically all her dresses, but we must not complain. The Lord will help us through. As soon as I hear something definitely from Wasla I will report again meanwhile I remain ¶ Yours in His service. ¶ David Haglund"
Adolfo Cockburn of Sacklin on the Coco River. Memo from Gen. C. B. Matthews, Jefe Director GN to Col. John Marston, Bluefields. "HEADQUARTERS GUARDIA NACIONAL DE NICARGUA MANAGUA NICARAGUA ¶ 27 April, 1931 ¶ From: The Jefe Director. ¶ To: The Area Commander, Eastern Area, Guardia Nacional, Bluefields, Nicaragua. 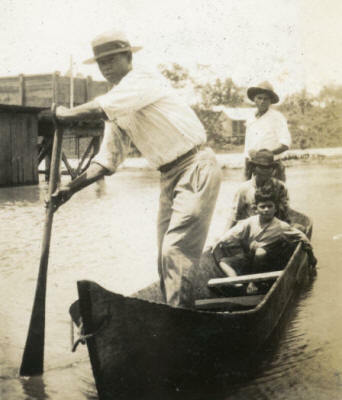 ¶ Subject: Adolfo Cockburn o fSacklin on the Coco River. ¶ References: (a) You Letter, 9 Feb. 1931. (b) Your Letter, this subject, 25 April, 1931. ¶ 1. Reference (b) is acknowledged. This headquarters, in view of the circumstances surrounding the activities of Cockburn, is desirous of bringing him to justice, but is reluctant, on account of his official capacity, immunity from arrest, and the fact that all reports against him are indefinite, difficult of proof and emanate from Americans, to make further representations to the President of Nicaragua in the case. ¶ 2. It is suggested, if practicable and if Cockburn’s actions are known to responsible Nicaraguans, for instance a person like the Jefe Politico, that as many as can and will state in writing their knowledge of the man and his activities with the bandit forces, do so either by direct reports to the President, furnishing your office a copy, or by submitting their reports to you. ¶ 3. Such reports, with the information now on hand will enable this office to make recommendations to the President for the removal of Cockburn from office and appropriate disciplinary action. ¶ Walter G. Sheard, ¶ By direction." Letter from Lisandro Salazar, Collector of Customs, Cabo Gracias a Dios, to Collector General of Customs & Resident High Commissioner, Managua, p. 1. "Sir: ¶ This port was captured by the bandit troops of General Sandino at 5 am, on the fifteenth of this month. They remained here until seven that evening returning up the river to Saclin, having come from that place. Many days before it was rumoured that Puerto Cabezas and Cabo Gracias a Dios would be attacked simultaneously. Early in March I advised Mr. Downing the Collector of Customs at Puerto Cabezas of this rumor, and certain things which I told him turned out to be correct. ¶ There was no shooting as the bandits entered the town as this port has not had a garrison for over a year, nor have we had the protection of even one policeman. Those who feared something disagreeable was about to happen did not have time to hide, much less to escape as the bandits had all the exits cut off. I was tranquilly waiting to see what would happen and was seated when four armed men of unfriendly appearance entered. ¶ “What is your name?” they asked. I gave my name and that of my office. They replied “Deliver the arms you have hidden, and open very quickly the doors to all departments and do not move”. I answered that I would open all the doors with pleasure but that it was impossible to give them arms because I had none. I could see that I was in a very dangerous position as two of them who appeared to be chiefs were intoxicated. At that moment my wife informed me that General Rivera was at the door and wished to see me. The armed men let me go and ordered my wife to open all trunks which she did and she watched them do what they pleased. They mixed everything up. ¶ I had an interview with General Rivera the leader of the troops and he did not treat me badly. He only asked me if there was money in the safe, which I opened to show him that it only contained a few dollars, and documents which showed money had been remitted to Bluefields. I explained to him the bad economic situation and that no merchandise was being imported on account of the lack of business. The day before we had heard that these troops were about to arrive any moment, and therefore I was prepared for any emergency and destroyed copies of letters which might have compromised me. ¶ From the Custom House they took six cases of shoes which had been deposited by the firm of J. Asmussen, valued at $500.00 more or less, and a case of medicines of Manuel C. Bordas, valued at about $50.00 and had not been entered because the necessary permit for granting entry in accordance with the law had not been received. They also took from the [...]"
Letter from Lisandro Salazar, Collector of Customs, Cabo Gracias a Dios, to Collector General of Customs & Resident High Commissioner, Managua, p. 2. "[...] Customs a 32 caliber long barrel revolver with its leather holster and a revolver 38 caliber which was personal property of the Collector of Customs. Other personal things taken are not worth mentioning. They lamented the fact that the Customs House was empty, in other words that there was no cargo. ¶ I know Mr. Rivera before and for that reason the situation was not tragic for me, but he declared in a very emphatic manner, that I was in a very delicate position, “Because of the circumstances of my holding Americans, and he wished me to understand as he was now commander of the troops I would suffer no injury, although the troops requested that strict measures be taken”. He advised me to be prepared for the future as on another occasion he might not be in command of the expedition. I request you to take note of this declaration. ¶ Shortly after I received a visit from General Humberto Caracas with his two aids. They asked me for arms and money, and I explained that I had already talked that matter over with General Rivera, but I spoke to them in as diplomatic a manner as the serious situation demanded. They also said I was in a very delicate predicament. I had known General Caracas in El Bluff during the revolution of 1926. ¶ After these gentlemen a Spanish official entered, armed with every weapon invented up to date, and asked me I was voluntarily dispose to write a kind thought about General Sandino in a book which he gave me. I really wrote about fifty expressions. He then asked me to affix the official stamp, which I did. If I denied their wishes, you can imagine the result: DEATH. ¶ I also wish to inform you that the store of the Chinese merchant, Wing Chung, was entirely ransacked. His losses amounted to about five thousand cordobas. The shelves were completely cleaned out. The store of J. Asmussen was partly ransacked owing to the fact that the Jefe directed the sacking. I estimate his losses at three thousand dollars more or less. It must be remembered that in January this year the Waspook branch store of Mr. Asmussen was looted with a loss of two thousand cordobas. ¶ The store of Albert Fagot suffered the same fate, with a loss of $2,500 more or less. Each one of them, Asmussen, Wing Chung, and Fagot were insured against fire and robbery by bandits. Mr. Fagot as is well known is an American citizen, and as the bandit chief expressed it, his head was not cut off because Mr Rivera first chief of Sandino’s troops was employed by Mr. Fagot for about twenty five or thirty years and was the recipient of many favors from him. It is significant that Mr. Fagot is selling his properties at a loss in order to go and live with his family in New Orleans, Louisiana, U.S.A. His properties which are well known and which have a good value are now being sold at a loss for about $20,000.- receiving $1,000.- down and the balance on time, payments to be made whenever possible. He is leaving the country after living here for thirty years or more, dedicated to honest work of agriculture and commerce. [...]"
Letter from Lisandro Salazar, Collector of Customs, Cabo Gracias a Dios, to Collector General of Customs & Resident High Commissioner, Managua, p. 3. "[...] The Tropical Radio Telegraph Company was partially destroyed as is well known, but the towers and machinery are intact. Experts from the American war vessels who arrived here to determine the damage estimated the loss to be $1,500.00 or $2,000.00 and it is said, that their property was also insured. Mr. Lester, the chief operator was saved from certain death, because he spent that night aboard his “Yate” anchoring outside the harbor. He had that facility. Besides the property destroyed 75 cases of gasoline and 20 boxes of Mobile Oil A, belonging to the station were taken. ¶ There were also other threats, besides a few small robberies, but all depredations stopped when airplanes arrived about 3.30 pm and threw as many as fourteen bombs without giving any warning. When the Sandino forces heard the noise made by the approaching engines, they took the red and black badges off their collars and hats and put them in their pockets, then hid themselves in or under the houses thus showing their cowardice. ¶ The store of Mr. Manuel C Bordas was seriously damaged by the bombs. The bombardment would have taken serious proportions with great losss if it had not been for the fearlessness of Mr. Hugo Fagot in raising the American flag on his father’s house. The aviators declared that this act saved the situation. Of course Mr. Fagot was in grave danger from the Sandinistas. ¶ The store of the merchant Mr. Abraham Martinez was sacked. These stores of this gentleman have been constantly looted and sacked since April 1928. He declares that his losses amount to $2,000.00 or more. He has completely withdrawn from doing business on the river, which concludes all commerce on the river as the branch of Mr. J. Asmussen in Waspook has been entirely closed, as it is impossible to maintain commerce on the river unless guarantees are given, and the property and interests of foreigners are protected. ¶ It must be mentioned in this report that the Rev. Earl Bregenser, who was in charge of the Musawas station for the Moravian Mission and Book store, was assassinated in an atrocious manner, vile if you can so call it, just because the Moravian institution is maintained by American capital. I beg you to take note of this paragraph. ¶ And all the foreigners who live on the river, those who produce, those who give life and work to many Indians, are running through the jungles seeking the companionship of wild animals, which after all turns out to be the best. And the commerce is seriously affected, because aside from the robbery of the merchandise, merchants were ordered to hand over any money they had. Therefore commerce will be dead or is already dead. The public morale is affected and about to disappear altogether, because banditry exists even in sporadic groups. [...]"
Letter from Lisandro Salazar, Collector of Customs, Cabo Gracias a Dios, to Collector General of Customs & Resident High Commissioner, Managua, p. 4. "[...] Here it is said the bandits will return within a few months. The bandits so advised. And I have also heard from other sources that they expect arms from some of the sister republics of Central America. It may or not be true. But if the Guardia do not intend to stay here for any length of time, everything else here will be lost. If the bandits return with a chief unknown to these people, not only will the village be reduced to ashes but many lives will be sacrificed. This is not a sentimental opinion. I believe that if a suitable number of the National Guard are not garrisoned here, it will be necessary to close the Custom House as it will be impossible to keep employees, no matter who they are. ¶ I wish to say that the Governor of this region was not in the Port at this time. The day before he left with his family for health reasons to Cabo Viejo about eight miles from here. ¶ I invited the Governor several times to come to this port and confer with the Captain of the American gunboat “Ashville”, but it was impossible to reach him. ¶ Please take note of what I have said. ¶ Respectfully ¶ (a) Lisandro Salazar, ¶ Collector of Customs, ¶ Cabo Gracias a Dios. ¶ P.S.- The only one here was the Director of Police who rendered very satisfactory services." Patrol Report, 1st Lt. Clyde R. Darrah, Bluefields, to Col. John Marston, Bluefields, p. 1. "From: First Lieutenant Clyde R. Darrah, G.N. ¶ To: The Area Commander, Area of the East, Guardia Nacional, Bluefields, Nicaragua. ¶ Via: (1) The Department Commander, Department of Northern Bluefields, Puerto Cabezas, Nicaragua. ¶ Subject: Patrol Report ¶ Reference ; (a) Letter of the Area Commander, dated 22 April 1931. ¶ (b) General Order No. 109-1929. ¶ Enclosure: (1) 1.- In accordance with the references the following report is submitted:- ¶ 11 Apr.31.- 12:30 P.M. received report that Captain Harlen Pefley had been killed and Raso Manuel Morales had been wounded by bandits at Log Town. ¶ 1:45 P.M. patrol including myself, fifteen enlisted men, and one civico, Mr. Beardsley cleared Puerto Cabezas for Log Town by train, arrived at Tigne Junction (Moss Farm) at 4:35 P.M. where four enlisted from Toledo Wye were waiting our arrival. Continued on to Log town with eleven enlisted and one civico by train, having eight men to follow by motor car. Arrived Log town 5:15 P.M. where Captain Pefley and patrol had contact, and where Captain Pefley was killed, searched all of Log town and vicinity. Commissary, house of the Overseer and food shed had been burned down. At 6:30 P.M. left Log town with ten enlisted and one civico. Mr. Beardsley for Cuyutigne where the bandits had been reported as having gone after leaving Log Town. 8:30 P.M. arrived Cuyutigne, searched there and immediate vicinity laid in ambush until 4:30 A.M., 12 April 31. ¶ 12 Apr. 31.- Left Cuyutigne at 5:15 A.M. arrived Log Town 6:00 A.M. Researched Log Town 6:45 A.M. left Log Town arrived Louisiana Farm where we found the balance of the Guardia patrol awaiting us. We were notified that one half hour after our patrol left Moss Farm by train and motor car, that bandits attacked there, killing eight men, four of which were Americans, two were commissary men, and two unknown. ¶ There were other bodies scattered between Moss Farm and Louisiana Farm 8:15 A.M. left Louisiana Farm for Moss Farm where bandits were still in force 8:30 A.M. had contact with bandits forcing them to retire. Raso Pascual Rivera was [...]"
Patrol Report, 1st Lt. Clyde R. Darrah, Bluefields, to Col. John Marston, Bluefields, p. 2. "[...] lines had been cut. Tried to send report into Port by motor car running one, but plan did not work as the Snaki Bridge had been tampered with. Two amphibian planes arrived about 11:30 A.M. bombed at Vaccaro Farm, and in the woods where it was later learned that bandits had been hiding. 11:40 A.M. patrol including myself, thirteen enlisted and Mr. Beardsley cleared for Vaccaro and D’Antoni Farms, arriving at D’Antoni at 1:30, enroute, searched Vaccaro and vicinity, also vicinity of D’Antoni. At Vaccaro Farm the bandits burned the commissary, the mandador’s house and threw other houses belonging to the laborers. Arrived Moss Farm at 3:00 P.M. Mr. Austin Murphy and one colored man arrived and notified me, that five hundred (500) more bandits under Pedron were enroute from the Wankgs River and intended to take Puerto Cabezas. 3:30 P.M. left Moss Farm with intentions of cutting off bandits at Wakiwas. Had contact with bandits while trying to cross Snaki Bridge where rails had been torn up. While Mr. Beardsley with a detail of Guardia repaired the rails, a detail under me held the bandits in check and forced them to retreat. No casualties among Guardia, while repairing rails on the far side of the bridge two planes arrived and made a drop, wanting to know where they could drop provisions and ammunition. Did not have time to answer, but made signals toward Wakiwas. 4:30 P.M. arrived Wakiwas. Received rumor there, that bandits numbering five hundred (500) under Pedron were coming through to Port burning and robbing on the way in. Intended to kill all machos (American). In Wakiwas we met Sergeant Taylor with eleven guardias, one applicant and one civico as re-inforcements. Made Camp at Wakiwas, making tactical preparations for a defense. 7:00 PM. In telephone communications with Guardia Headquarters in Puerto Cabezas, explained the situation, and asked for food and ammunition. 9:00 A.M. received code message from Captain Wood, that he would arrive about 6:00 A.M., 13 April 31 with re-inforcements, food and ammunition, and for my detail to be prepared to move forward immediately upon his arrival. ¶ 13 Apr. 31.6:30 A.M. Captain wood, Lieutenant Simmer and six enlisted men arrived. Captain Wood immediately taking charge of the entire patrol. 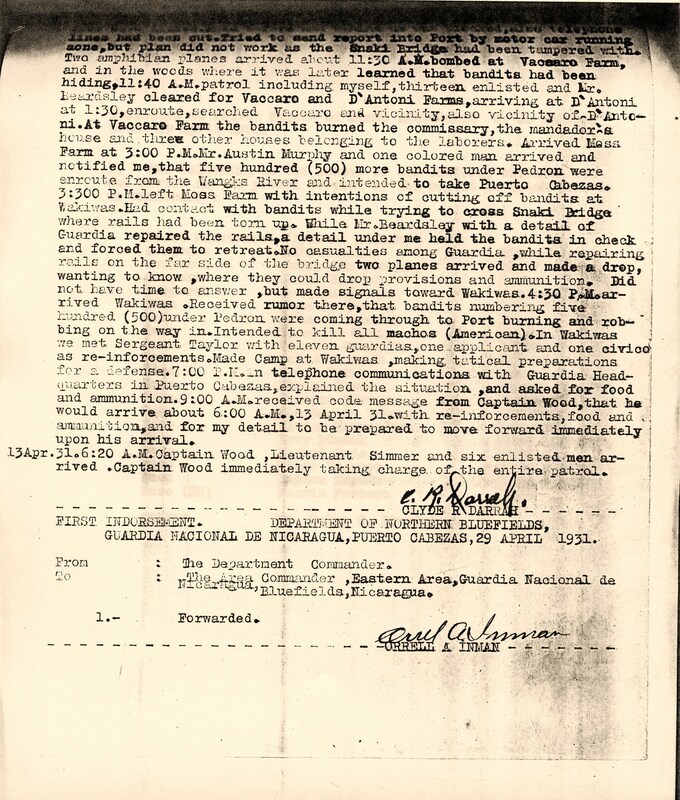 (signed) CLYDE R. DARRAH [...]"
Patrol Report, 1st Lt. Clyde R. Darrah, Bluefields, to Col. John Marston, Bluefields, p. 3. 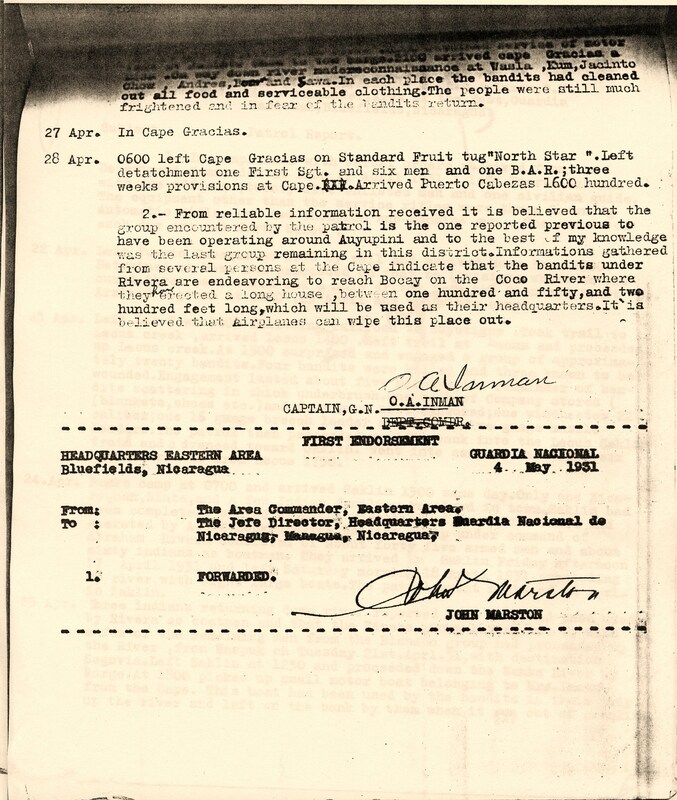 "[...] Enclosure to Patrol Report of First Lieutenant G.N. Darah, dated 29 April 1931. ¶ 1. 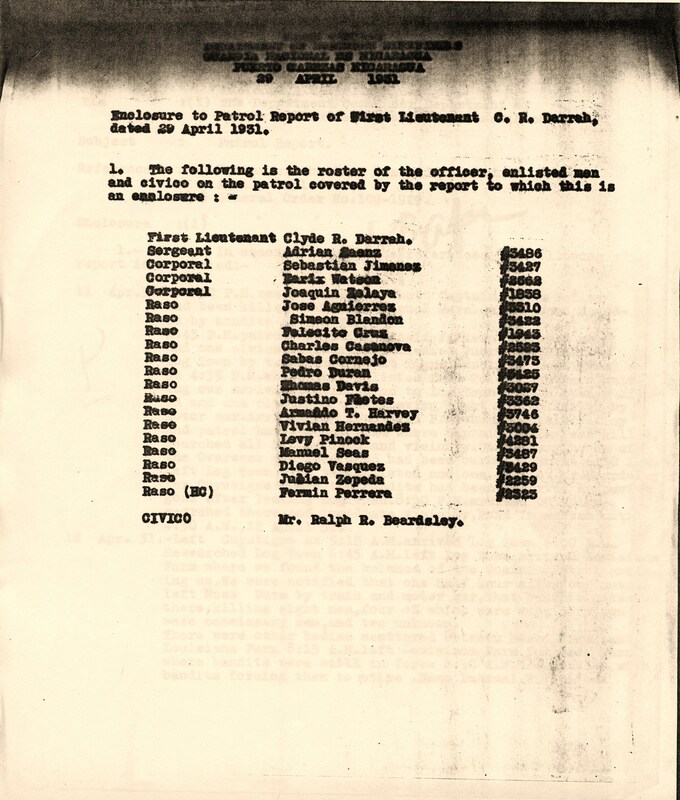 The following is the roster of the officer, enlisted men and civico on the patrol covered by the report to which this is an enclosure:= ¶ First Lieutenant Clyde R. Darrah. ¶ Sergeant Adrian Saens #3486 ¶ Corporal Sebastian Jimenez #3427 ¶ Corporal Earix Watson #2562 ¶ Corporal Joaquin Zelaya 31838 ¶ Raso Jose Aguirrez #5510 ¶ Raso Simeon Blandon 31943 ¶ Raso Felesito Cruz #1945 ¶ Raso Charles Casanova #2535 ¶ Raso Sabas Cornejo #3675 ¶ Raso Pedro Duran #5425 ¶ Raso Thomas Davis #3027 ¶ Raso Justino Fletes #3746 ¶ Raso Vivian Hernandes #3054 ¶ Raso Levy Pinock #4281 ¶ Raso Manuel Seas #3487 ¶ Raso Diego Vasquez #3429 ¶ Raso Julian Zepeda #2259 ¶ Raso (HC) Fermin Perrera #2323 ¶ CIVICO Mr. Ralph R. Beardsley." Patrol Report, Capt. O. 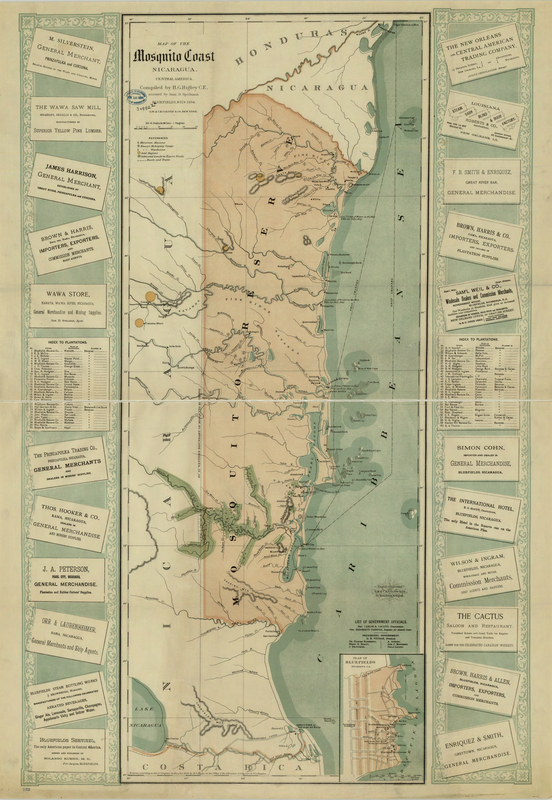 A. Inman, Puerto Cabezas, to Col. John Marston, Bluefields, p. 1. "From: Department Commander, Capt. O.A. Inman, G.N. ¶ To: Area Commander, Area of the East, Guardia Nacional,¶ Bluefields, Nicaragua ¶ Subject: Patrol Report. ¶ 1.- In compliance with verbal orders received from the Department Commander at 1200 22 April 1931 I left Puerto Cabezas with one officer, twenty five enlisted men and one civilian guide. The equipment other than the service rifles were three Browning Automatic rifles and two Thompson sub-machine gun. The event of each day are set forth below: ¶ 22 Apr. Left Puerto Cabezas at 1430 by rail and arrived Moss Farm 2300. Detrained at Moss and proceeded on foot to Louisiana where we procured three pack mules and a mule driver from the Standard Fruit Co. Arrived Logtown at 0230, 23 April and went into camps. ¶ 23 Apr. Left Log Town 0600 following railroad to Cuyutigne. Took trail to Lecus creek, arrived Lecus 1400. Left trail at Lecus and proceeded up Lecus creek. At 1500 surprised and engaged a group of approximately twenty bandits. Four bandits were killed and three known to be wounded. Engagement lasted about five minutes; the remainder of bandits scattering in thick underbrush. One sack of Company stores (blankets, shoes, etc.) and four guns were captured; one Winchester 22 caliber; one 16 gauge breech loader and two twelve gauge muzzle loaders. The patrol then proceeded rapidly back into the Lecus Saklin train and advanced toward Saklin. Went into camp on the trail six kilometers out from Lecus 1730. ¶ 24 Apr. Broke camp at 0700 and arrived Saklin 1300 same day. Only one Nicaraguan, Slate, and a few Indian families remained in town. Saklin had been completely sacked with the exception of one store owned and operated by Adolf Cockburn. The bandits group under command of Abraham Rivera consisted of about forty five armed men and about sixty Indians as boatmen. They arrived in Saklin Friday afternoon 17 April 1931 and left Saturday morning 18 April 1931, proceeding up river with eight large boats. The patrol spent night of 24 April in Saklin. ¶ 25 Apr. Three Indians returning down river reported that they had been used by Rivera as boatmen and that the Rivera group having met up with a few of the remaining men from the Blandon group had proceeded up the River, from Waspuk on Tuesday 21st April 31, with destination Segovia. Left Saklin at 1230 and proceeded down the Wanks River by barge. At 1800 picked up small motor boat belonging to Mr. Lester from the Cape. This boat had been used by the bandits in their trip up the river and left on the bank by them when it ran out of gasoline [...]"
Patrol Report, Capt. O. A. Inman, Puerto Cabezas, to Col. John Marston, Bluefields, p. 2. "[...] arrived Cape Gracias a Dios way down river made reconnaissance at Wasla, Kum, Jacinto Chow, Andres, Boom and Sawa. In each place the bandits had cleaned out all food and serviceable clothing. The people were still much frightened and in fear of the bandits return. ¶ 27 Apr. In Cape Gracias. ¶ 28 Apr. 0600 left Cape Gracias on Standard Fruit tug “North Star”. Left detachment one First Sgt. And six men and one B.A.R. ; three weeks provisions at Cape. Arrived Puerto Cabezas 1600 hundred. ¶ 2.- From reliable information received it is believed that the group encountered by the patrol is the one reported previous to have been operating around Auyupini and to the best of my knowledge was the last group remaining in this district. Informations gathered from several persons at the Cape indicate that the bandits under Rivera are endeavoring to reach Bocay on the coco Rive where they have erected a long house, between one hundred and fifty, and two hundred feet long, which will be used as their headquarters. It is believed that Airplanes can wipe this place out. ¶ (signed) CAPTAIN, G.N. O. A. INMAN FIRST ENDORSEMENT ¶ HEADQUARTERS EASERN AREA GUARDIA NACIONAL ¶ Bluefields, Nicaragua 4 May 1931 ¶ From: The Area Commander, Eastern Area. ¶ To: The jefe Director, Headquarters Guardia Nacional de Nicaragua, Managua, Nicaragua. ¶ 1. FORWARDED. ¶ (signed) JOHN MARSTON"